Welcome to the first in a monthly series of features on inspiring businesses. This month’s feature is Jen Mills from The Floricultural Cabinet, a freelance florist based in the seaside town of Budleigh Salterton, East Devon. 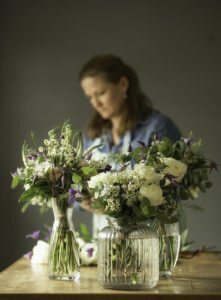 Jen started her bespoke florist business in 2011 and shares with us her insights into the inspiration in and behind her business. I have a background in art & design and graduated from The Royal College of Art with an MA in 3D Design in 1998. I’ve always loved plants and flowers and all things botanical. So when a friend approached me in 2010 to ask if I’d be interested in opening a floristry shop with her, I was really excited. She was already a qualified (and very talented) florist and floral designer, and while the idea definitely grabbed my interest, my sensible side told me I couldn’t go into a business I knew so little about. So I started my training at The (rather splendid) Academy of Floral Art which is based just outside Exeter. I completed both my level 2 and 3 there, and am currently planning for the start of my level 4 City and Guilds. We never did open a shop, but during the time I was training, we started knocking on the doors of businesses and winning contracts for some fantastic corporate clients. Our families have expanded since then and the business has evolved, and I’m now working on my own. The name of the business ‘The Floricultural Cabinet’ (which is admittedly a bit of a mouthful) is very special to me. It comes from the eponymous Edwardian gardening book. I inherited a copy of it from my Grandfather (“Gappy”) when he died, after having used its’ beautiful hand-tinted botanical illustrations as the basis for an A’level art project. He was head gardener around various large estates in Scotland over the years, and I suspect a lot of our familial passion for all things planty stems* from him. (*see what I did there). Apart from being surrounded by gorgeous fresh flowers? I love the variety. As well as being in the privileged position of providing flowers for some of the most important times in peoples’ lives, I teach part-time at The Academy of Floral Art, and I run my own workshops throughout the year. I really enjoy the nuts and bolts of running a small business, and although it can be challenging at times, it’s never boring! What is the biggest challenge you face in your business? Honestly, the biggest challenge is being answerable only to myself. If I don’t set myself goals and targets, nothing would ever move on. It is very easy when you work for yourself to find things to do other than move out of your comfort zone (eg re-arrange bookshelves in order of colour etc etc…) But those are often the things that bring the most rewards. What is the must-have item on your desk or in your workplace? Hmm. That is a tricky one. 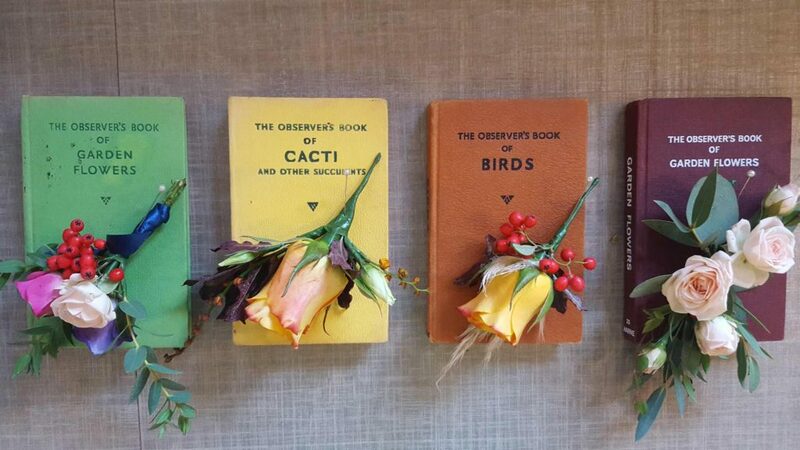 I think Julie Collins from the Academy (of Floral Art) drummed into me when I was training the very un-British process of recognising the value of your own time. It’s very easy to do lots of things as favours, and I love to help people out, but ultimately this is my job and I have to earn a living! Whilst training, we costed everything we made very thoroughly to ensure customers got good value and we got paid; that has stuck with me. What have you learnt about yourself from being in business? That I have a disproportionate lack of self-belief. I’m working on that one! Who inspires you and your business? I find inspiration everywhere – nature, (the Devon countryside is great for that, and I am a nature lover) other floral designers ( for example Gregor Lersch, Christine De Beer, Pim Van Den Akker) artists, (I particularly love the likes of Antoni Tapies and Cy Twombly) the list goes on…. What piece of advice would you give to someone beginning in business? Set yourself realistic, incremental goals, and put a timescale on them. Have someone, anyone- a friend, partner, whoever, check up on what you have done to work towards them. And believe in yourself! And finally…what makes your business special and why should people hire you? As a qualified florist and designer, I don’t necessarily need my clients to come to me with a finished idea in their head about their flowers, actually far from it. And my clients don’t need to know anything about flowers either- that’s why you use a trained florist! As part of the design process, I love to hear about a couples’ likes (and dislikes), whether that’s in interiors, gardens, fashion, art or wherever they find their inspiration. 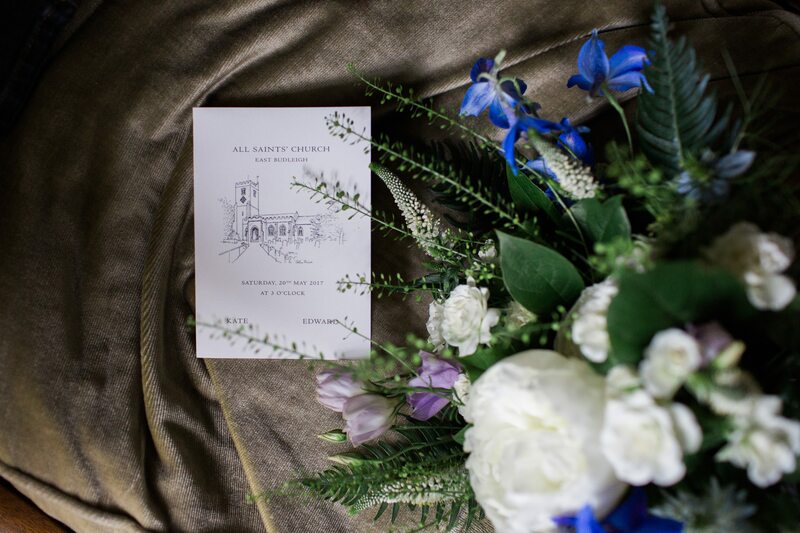 My aim is to produce a design and a flower combination to reflect their style, and generally, I find the more a couple can trust their wedding design professionals, the better the results will be! If you’d like to feature in our inspirational business series please pop over here and complete the submission form and we’ll be in touch!